The trailers for the History Channel's upcoming ten-episode series Project Blue Book isn't called a documentary, which is understandable because the trailer makes it look like a stunning new sci-fi movie about an invasion in the 1950s! Watch the trailer and you'll see what I mean. 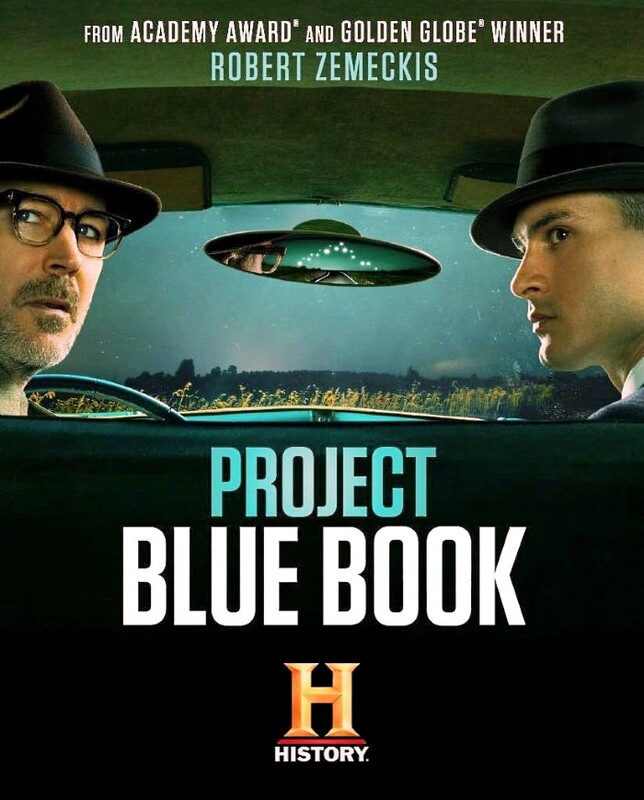 _____ New UFO Drama Series "Project Blue Book"
But wait a minute, this series is produced by the History channel, not the so-called SyFy (channel), and the trailer ends with the four-word phrase, "Based on true events". We should bare in mind that Earth vs the Flying Saucers has this in the opening credits. I have Major Keyhoe's book sitting on my coffee table right now. Look closely at the poster. It took me a moment to realize that we're not seeing a saucer above the road in front of the car. It's actually the rear view mirror (attached to the windshield, something that 1950s cars didn't have), and it's shaped like a saucer instead of a rectangular rear view mirror. The reflection in the mirror shows us the strange lights above the road behind the car, but at first glance it looks like a saucer with chrome-like underside. Now seriously, does anybody believe that the poster isn't inspired by the scene from Earth vs the Flying Saucers shown in my mock up below? 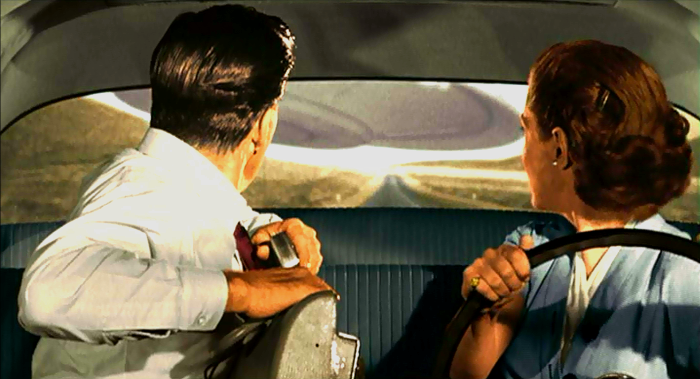 Just for fun, I checked to see if the car in Earth vs the Flying Saucers had a rear view mirror. — but of course there WAS a rear view mirror in the real car when Hugh and Joan stopped. And while checking out that trivial detail, I noticed another trivial detail. When the car stops, the seat covers change color! The car "set" has a dark gray interior, but the actually car's interior is white. Well.....Those are the COLORIZED stills. How did it look in the original B&W? Still appears to be a continuity error though! Those are actually screen grabs from the colorized version on my DVD, which I needed for the picture I used in my poster mock-up so it more closely matched the real poster. I tried making them B&W because the color doesn't make those scenes look much better, but the color did help by making the rear view mirror and the amazing color-reversing upholstery more noticeable, so I did what I could to improve the crappy color and left them that way. I have mixed feeling about this new series. 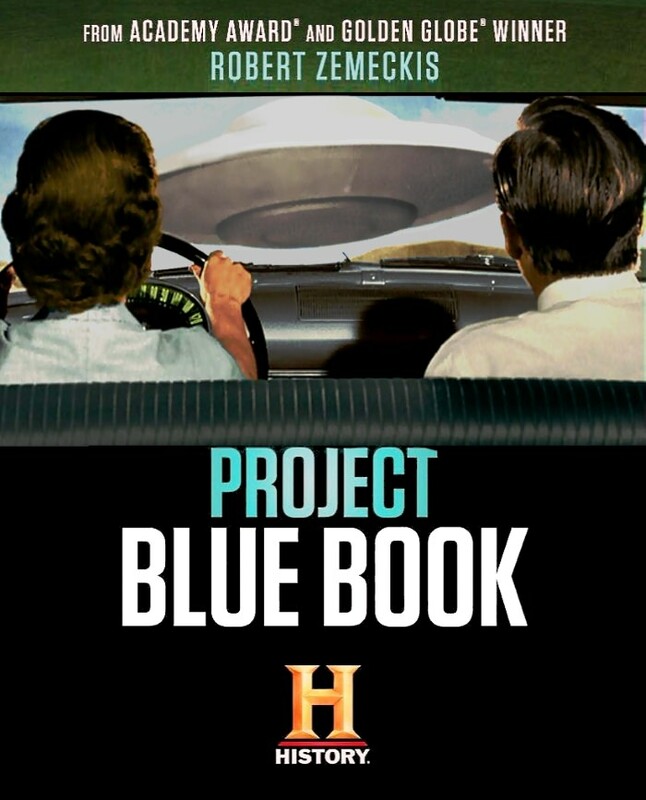 Project Blue Book is a collection of data from years of careful investigation by qualified people who spent many hours collecting information about UFO events. Turning that information into a dramatic piece of fiction which presents exaggerated versions of real events is certainly an admirable way to create great science fiction. However . . . presenting such a production as something "base on true events" and naming it Project Blue Book is, frankly, a Big Fat Cheat! And having this glitzy production aired on the History channel, the network which aired highly regarded productions like Moonahot back in 2009, is troubling for people like me who expect the History channel to present facts . . . not fiction. So, in view of the way this series has obviously sensationalized the history of UFO research and turned it into a retroactive fifties sci-fi movie, I don't expect to be to fond of this upcoming production. But . . . I'd much rather be wrong. I'm still hoping this won't be disappointing. The BIG thing is to make 'limited series' or 'mini series' and SAY that they are based on "true" or "actual" incidences — when they are not. I'm hoping also, but don't have high hopes. I suspect I might like this if I just to enjoy it for what it is . . . not for what it SAYS it is. Based on real events...yes...but much dramatized and with a lot of speculation. Touched upon the classic "Men in Black" legend , the Majestic-12, and the real Allan Hynek. Looking at it as a cross between The X Files and the 70's series "Project UFO". I really enjoyed the 50's context and the rather noir filming effect. From this first episode I'd have to give it a thumbs up and plan to watch it as it goes on. Now that I have four episodes on my DVR I finally got around to watching the pilot episode. It was very enjoyable because it did a fine job of presenting the fear and fascination about UFOs during the 1950s. The first episode didn't have the usual "aliens are among us" element that would rob it of the tantalizing concept that the aliens are all "up in the sky" — not lurking around here on Earth in human form. One thing I'm worried about, however, are the various military and government characters who only seem to want to "prove that flying saucers are not real" to calm the public. 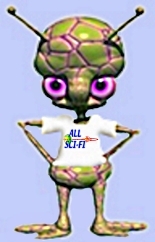 We here at All Sci-Fi are well aware that in 1956 the government cooperated completely with the producers of Unidentified Flying Objects: The True Story of Flying Saucers (1956), which is the story of real-life Los Angeles newspaper report Al Chop, who was hired by the Pentagon to insure that news reports about UFOs were reported accurately! That clearly refutes the basic premise of Project Blue Book which wants us to think that their was a government conspiracy to convince the public that all the reports of UFOs were bogus. 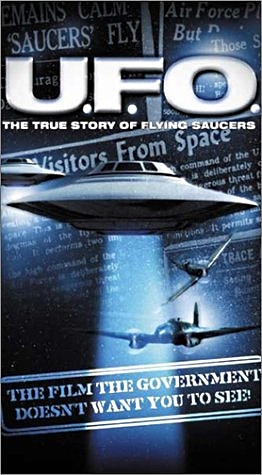 Please note that in Unidentified Flying Objects: The True Story of Flying Saucers, Mr. Chop started out as a UFO "doubting Thomas", but because of his exposure to hundreds of official UFO reports he ends up believing that the one-and-only explanation was that these objects were vehicles from other planets! This revelation at the conclusion of the film presents a dynamic climax. If you haven't seen the movie, here's a fine copy from YouTube. The picture quality equals my commercial VHS tape, and unfortunatly there isn't a DVD copy available. Amazon offers the VHS tape I have for $39.95, and the picture quality looks pretty good. Years ago I transferred mine to a DVD-R, and the friend who converted it for me also created an enhanced version of the VHS box art which is wider (to fit the DVR box) and has more saucer! I wish I had a jpeg of it. It's beautiful! As for the movie, don't expect a slick production that tries to entertain you, this is a no-nonsense documentary that proves its legitimacy simply by presenting hard facts with a believable re-enactment of Al Chop's slow conversion from skeptic to believer. No UFO documentary comes anywhere close to convincing me that a significant percentage of UFO encounters have genuine merit. History has picked up the Robert Zemeckis-produced UFO drama Project Blue Book for a 10-episode second season, the network announced on Sunday. 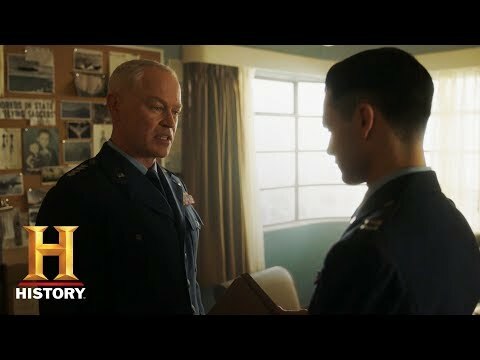 The scripted drama, inspired by the personal experiences of Dr. J. Allen Hynek (played by Game Of Thrones alum Aidan Gillen) amid the top-secret military investigations into UFOs and related phenomena in the 1950s and 1960s, debuted on the network last month. It would be helpful if you'd let us know your source whenever you share an article like this. Just tack the link onto the post at the top or the bottom. I did a quick Google search using a sentence from your post and found out it was from The Wrap. I hate to say it folks, but after watching the second episode of this series, I'm very disappointed by the way the producers have opted to make the series all about an alleged conspiracy to cover up UFO evidence at all cost, and to discourage all public inquiries. I can prove that the exact opposite was true! The government was NOT covering up and explaining away UFO reports in the earlier 1950s, they were actively supporting legitimate investigators like Major Donald E. Kehoe by giving them access to the files pertaining to unexplained UFO events. In the acknowledgement to his books (one of which is sitting on my coffee table right), Major Keyhoe thanks the government for their full cooperation by providing things like sworn testimony from eyewitnesses, flight records from civilian and military aircraft, and police reports from all over the nation. The Wikipedia article about Major Keyhoe includes this statement. Captain Edward J. Ruppelt, the first head of Project Blue Book, reported that "It is rumored among magazine publishers that Don Keyhoe's article in True was one of the most widely read and widely discussed magazine articles in history." 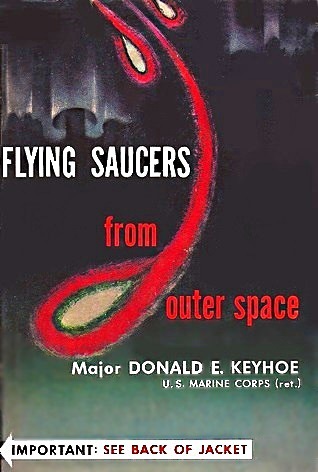 Keyhoe's first book, Flying Saucers Are Real (1950) sold over half a million copies in paperback. 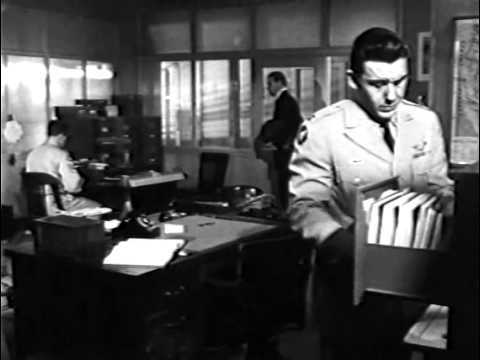 Flying Saucers from Outer Space (Holt, 1953) is perhaps the most impressive, being largely based on interviews and official reports vetted by the Air Force. The book included a blurb by Albert M. Chop, the Air Force's press secretary in the Pentagon, who characterized Keyhoe as a "responsible, accurate reporter" and further expressed guarded approval for Keyhoe's arguments in favor of the extraterrestrial hypothesis. Albert M. Chop is the key figure in the UFO documentary called Unidentified Flying Objects: The True Story of Flying Saucers (1956), played in the film by Tom Towers, the aviation reporter for the Los Angeles Examiner. 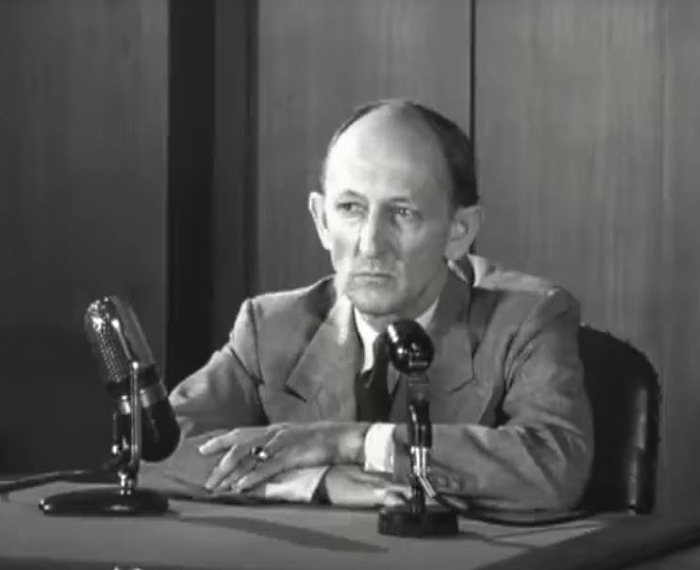 At the 1:18:40 mark in the YouTube video shown above, you can see newsreel footage of the Pentagon press conference held by USAF Intelligence Chief Major General John Samford, which was held after the two amazing UFO events that took place over Washington, D.C., involving multiple radar contacts around the area, numerous witnesses, and Air Force pilots who pursued the objects. The events, which occurred on two consecutive weekends, lasted for several hours each and involved both civilian and military radar stations, as well as pilots and control tower people who witnesses the orange glowing objects. "We knew immediately that a very strange situation existed . . . their movements were completely radical compared to those of ordinary aircraft." No attempt was made to explain away these two dramatic and disturbing UFO events. One of the jets that were dispatched to intercept the seven unknown aircraft directly over the nations capital was actually surrounded by UFOs in close proximity for several minutes while the pilot spoke on the radio and described what was happening. Watch the amazing recreation of that event at the 1:08:00 mark. It's the best moment in the movie. Read the remarkable story in the Wikipedia article about this event, which describes what radar operators observed, and what control tower personnel and airline pilots saw as well. The description of the July 26-27 event agrees with the events portrayed in the movie, such as how, on one occasion, all the objects vanished from the radar screens at three locations simultaneously, but they all reappeared the moment the jets left the area! My point, folks, is that between 1950 and 1956 (when the UFO movie was released) there seemed to be no concerted effort on the part of the government to hide information or discredit what General Samford refered to during the press conference about the Washington events as "reports made by credible observers, of relative incredible things." At 00:1:50 in the video (immediately after the opening credits) you'll hear a very bold statement about just how seriously this movie takes its subject matter, along with its efforts to be authentic. Please consider the government's attitude towards Keyhoe's books and the cooperation he got — along with the movie's attitude towards UFO investigations — and compare these facts to the bogus "conspiracy" that Project Blue Book is trying to claim is being "based on true events". Yes indeed, I'm very disappointed . . .
At the beginning of episode three we see this young-looking actor, Adam Greydon Reid, being introduced on a radio interview as "MISTER Don Keyhoe". Not "Retired Marine MAJOR Donald E. Keyhoe" — who, by the way, was born on June 20, 1897, which means that Major Keyhoe was 54 (and bald) in 1951. Major Keyhoe can be seen at the end of the Youtube video which is linked to this screen shot below. 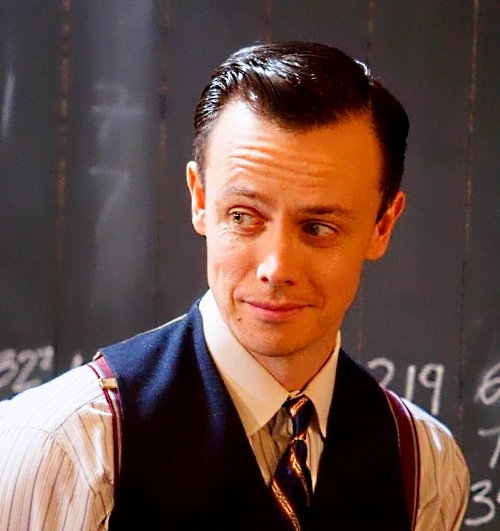 I can't say I'm very impressed with the casting director who picked Mr. Reid to play Major Keyhoe. Episode three also dresses up the Lubbock Lights UFO sighting with a depiction of a several massive power outages across the entire city whenever the V-shaped lights fly over (traveling way too fast to match the actual event, which actually happened repeatedly over a period of two weeks, not just twice, as we see in the episode). For the record, the Lubbock Lights moved very slowly and silently, which is why an 18-year old boy took several pictures of them. You can read about the Lubbock Lights UFO event on the History Channel's website . . . but you'll find absolutely no mention on any power outage connected with it. The series just threw that in to make it more like Close Encounters of the Third Kind. In short, the actual event doesn't match the episode at all. They even tossed in a scene with the two investigators experiencing strange things happening to their car which were similar to what happened to Richard Dreyfuss' truck in that same movie . . . just as the V-shaped lights raced overhead and were gone in seconds. I guess I'll just give up expecting this series to make any pretense of being "based on true events". Clearly that's a big fat lie. By the way, I noticed that IMDB lists Major Keyhoe this way. Oops. They left out the Y in Major Keyhoe's name.